The country’s long civil war may soon end—but not without triggering a violent backlash from the narco-elite and the paramilitary groups they command. Before the United States elects a new president on November 8, a potentially more consequential vote will take place in the Americas. On October 2, Colombians will say yes or no to a peace agreement between the government and the FARC, an insurgent group whose roots stretch back decades, to the very beginning of the Cold War. It’s notoriously difficult to tally the number of the war’s victims, especially those who lived in the countryside, but this 2013 report by Colombia’s Historical Memory Group gives an idea of the scope of the brutality: hundreds of thousands dead, tens of thousands disappeared, serial massacres and systemic torture. In other words, Colombia’s long, long civil war has functioned as something like a war for the frontier, with paramilitary “settlers,” bankrolled not just by Washington, US corporations, and narco profits but also by international development banks, dispossessing smallholders. Many of the victims of this land rush were Afro-Colombian and indigenous communities, who make up a disproportionate percentage of the displaced. Mining, oil, and bio-fuel production have been the main drivers of much of the violent dispossession. In many ways, Uribe and Santos embody platonic ideals of two opposing political factions: Santos represents the traditional urban oligarchy; Uribe, in contrast, bears the standard of the nouveau-riche country bumpkin, a paramilitary class that, during Uribe’s presidency, had not only taken the highest level of political power but insinuated itself into all the country’s major institutions: the courts, the intelligence system, and the congress. Back in 2008, just as a number of captured death-squad leaders were set to expose Uribe’s ties to paramilitarism, they were, according to a recent report by Deborah Sontag in The New York Times, swiftly extradited to the United States. Though the terms in which they will lose power are vaguely delineated in the peace accords, death-squad leaders rightly recognize the accords as a threat to their social power. And they have reacted in kind, accusing Santos of raising up the FARC as the moral equivalent of the armed forces and of being more concerned with getting favorable coverage in the international press and hobnobbing in Havana than providing security for citizens. Like Trump in the United States, Uribe is trying to rally the country’s security forces by appealing to resentment, saying that Santos negotiated away too much to the FARC. “It is unacceptable to justify the terrorist assassination of soldiers and police,” Uribe recently said. With polls turning against him, Uribe last week sent a letter to both Hillary Clinton and Donald Trump, appealing to the two candidates to denounce the Cuban-brokered accords. Clinton actually has a long history with Uribe, praising him in her memoir as a “hard-nosed, hands-on leader.” Both Bill Clinton, as an extremely well-compensated private citizen, and Hillary Clinton, as secretary of state, pushed for a free-trade agreement with Uribe’s Colombia. And the Clinton Foundation had deep ties with many of the Colombian interests that benefited from Uribe’s “hands-on” security policy. Uribe’s ratcheting up of the extremist rhetoric, even if it fails to convince a majority of voters to cast a no ballot, is poisoning the peace process, and bodes ill for the future. The last time Colombia came this close to peace was in the mid-1980s, when peace talks between the FARC and other insurgent groups led to the establishment of the Patriotic Union (UP), a broad political coalition of leftists, including former insurgents, committed to run for political office. Quickly, the socialist party became a viable third party, challenging the lock on the state held by the oligarchic Liberals and Conservatives for decades. It was, for a brief period, “the most successful leftist party in Colombian history,” according to The Washington Post. Even more quickly, party members became targeted by landlords, death squads, and narcos for elimination. The death toll is staggering: between 4,000 and 6,000 members of the Patriotic Union were murdered. More than 70 percent of all center-left presidential candidates in 1990 were assassinated as well. The murders were carried out by “a combination of drug dealers, right-wing paramilitary groups and members of the incumbent government and army”—a coalition that was in effect sanctioned and supported by Ronald Reagan’s renewed Cold War in Latin America. The US ambassador to Bogotá was opposed to the peace process, as Gabriel García Márquez noted at the time. And Washington was willing to work with drug traffickers when it suited them, especially when they were killing leftists. As Mario Murillo writes: “The UP was made up of some of the most articulate voices and brilliant political minds of the Colombian left. Included in its ranks were progressive activists and intellectuals from the Communist Party, as well as the traditional parties, local and regional social movements, and the guerilla movement itself and its support base.” The slaughter of these Colombians, who mistakenly believed they would be allowed to participate in the political system, led the FARC to remilitarize, and to finance that remilitarization through narcotics and kidnapping. 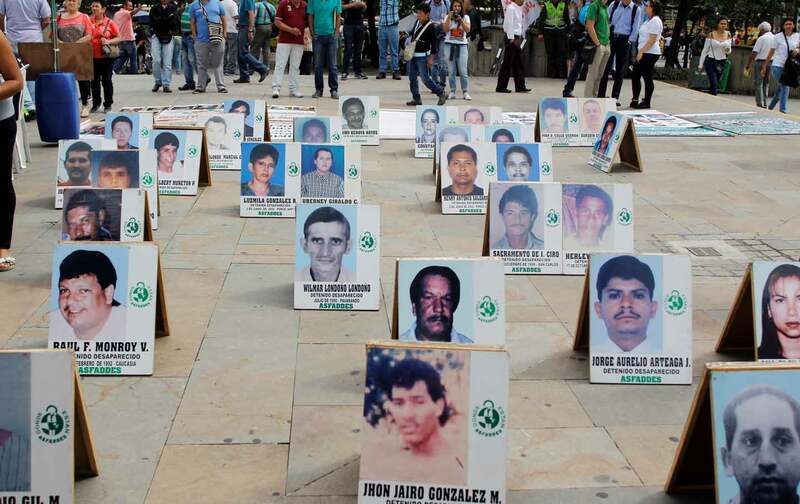 For many of Colombia’s establishment politicians, the systemic and coordinated executions of UP candidates revealed for the first time the true power of the narco-paramilitaries. “We are before an organization stronger than the state,” former president Belisario Betancur said in November 1987. “The river of blood that is running through Colombia…appears to be conducted by criminal groups of great economic and logistical power which have the resources to strike wherever and whenever they want,” said Betancur. “You cannot talk about peace,” UP presidential candidate Bernardo Jaramillo said in February 1989, “if you do not effectively combat against paramilitary groups.” Jaramillo was dead within a year. It is this “organization stronger than the state” that Alvaro Uribe effectively transformed into the state, especially in many rural regions where paramilitary affiliates run local governments. In the current peace process, President Santos, as did his predecessors in the 1980s, has committed the power of the national government to protect former guerrillas as the FARC transforms into an electoral party. Consequently, locals are terrified about the spike in political violence. The increase in killings and death threats was confirmed by independent electoral observers. According to The Washington Post, the FARC hasn’t yet revealed the name of its future political party and can’t begin to form one until it disarms. Let’s hope when it does, it has better fortune than the Patriotic Union.